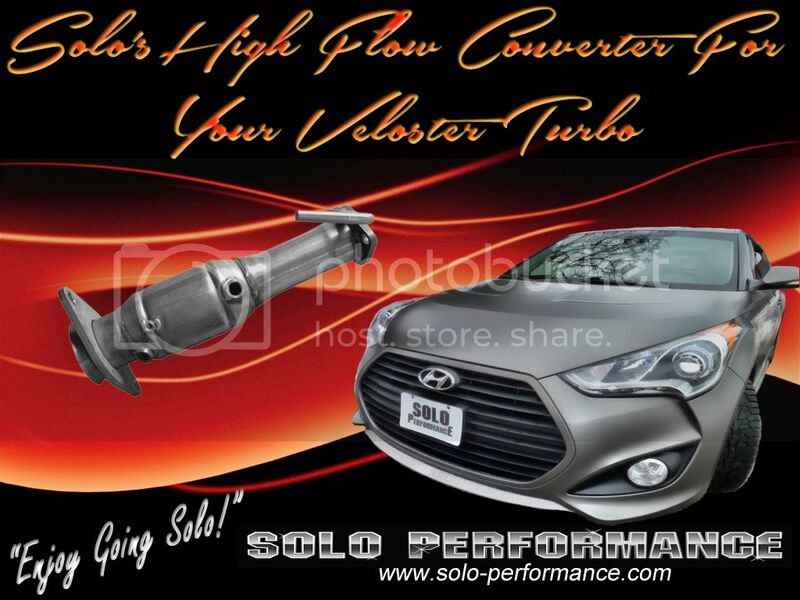 All of us at Solo Performance are excited to bring our Veloster Turbo Ultra High Flow Stainless Steel Catalytic Converter to the Veloster community. The 200 cell, spiral wound, ultra high flow converter used in this application offers maximum flow and is rated to 6.0L of cleaning ability. We have 6 “test” units that have been on peoples car for over 500 miles each and we’re happy to report that there are no engine light issues. These heavy duty stainless steel converters (stainless steel inside and out) are built to do the job and keep your engine light off. With the addition of the Solo Performance Ultra High Flow Cat, you not only increase your flow, but also get a louder, deeper, more aggressive exhaust note. Restriction causes an exhaust to be quieter and when you take the restriction away (the stock converter), and replace it with something higher flowing (the Solo cat), you increase both flow, sound, HP and torque. Enjoy Going Solo! 200 cell stainless steel spiral wound design. This design is long lasting, ultra-high flow, and completely stainless inside and out. Converters are far overrated for the car, at 6.0L. Includes a heavy duty stainless steel 3/8” thick front and rear flange. All components to this converter stainless steel. These converters are not CARB certified, but they do pass all emissions and keep the CEL light off. • They are technically for off road use only. No CEL or engine lights. Includes screw hole to attach the factory O2 wiring harness just like the stock converter. A computer tune is recommended with the high flow converter. Last edited by GOINGSOLO2; 10-29-2017 at 07:03 PM. mwil028, Samool and ecfisher like this. About time Steve . Ive posted the link on VT.org This is a great product and think everyone should own one. Im sure this will be a huge hit much like your CB. Best of luck! Thanks so much for posting that and we hope that this is a customer favorite We have taken extensive time to get this right and make sure the product released is top quality! Here ya go gang! JUMP on this GB if you can. I also highly recommend it as well. Will there be a group buy for the hi flow cat for the NA Veloster as well? This is well worth the price if you are at all interested in getting a great return for your money. The numbers are on a few other pages showing a huge gain, and with a tune, it will make our little sleepers wake up. 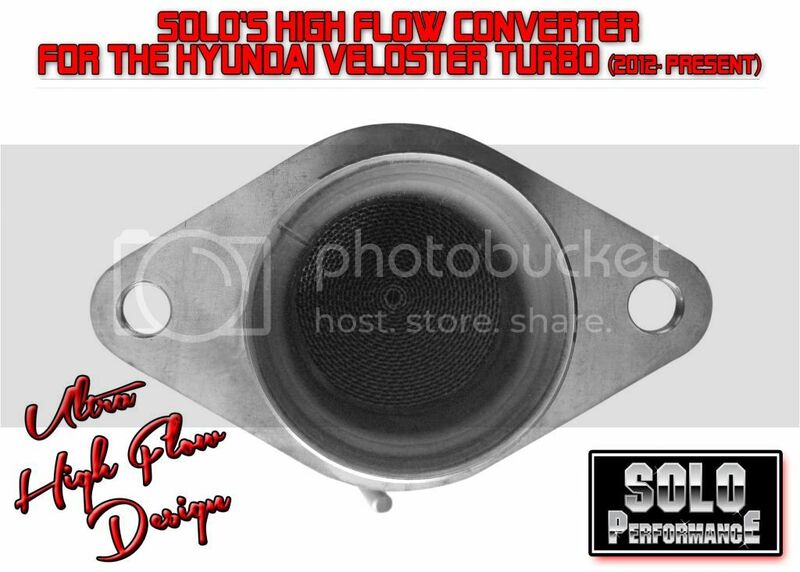 High flow converters are in stock and still at group buy pricing...call today to wake up the sleeping beast in your Veloster Turbo!! Yes, the group buy is still on until September 30. Call me at 516-655-9002 to place your order. Thanks. Whats HP looking like with this bolted up to the solo 3" cat back? Or is the dyno you posted WITH the catback too? Id like to know before dropping 300+ bucks anyone have a dyno??? ADDing the DP bumps it up to 204 hp and 210 tq? so the gain with adding this DP to the solo catback = 15 hp and 9 tq?? Last edited by Triton05; 09-13-2013 at 01:51 PM. Holy cow, if someone wants me to buy one. Id like some clarification.. I have money in hand here.. Mine just showed up today. Cant wait to install just gotta wait to get my VT back from the body shop. Last edited by GOINGSOLO2; 09-14-2013 at 05:10 PM. Still time to get in on the group buy for these high flow converters. They are bolt on, no CEL, and add tons of power. Call me direct at 516-655-9002 to get in on the group buy. Can I run this without the cat-back? Yes, they directly replace the OEM cat, so they will bolt up to the stock exhaust as well. Thanks. How long before we'd get them?